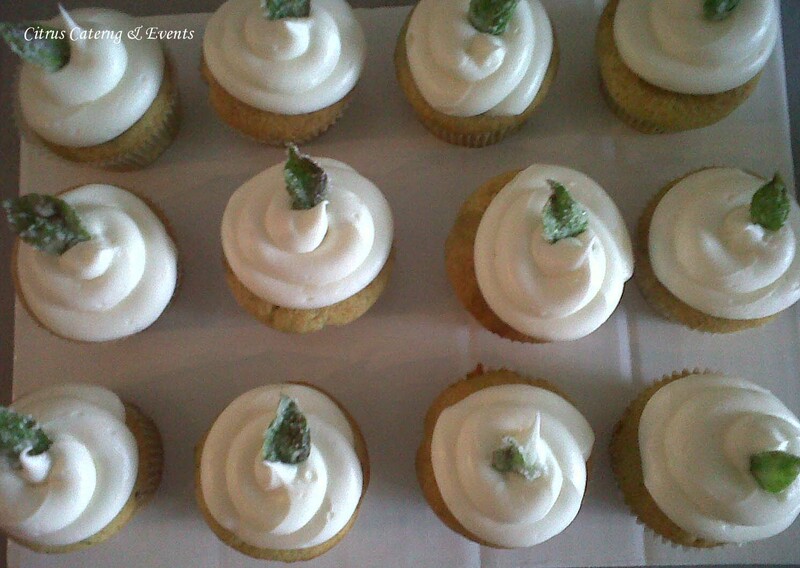 Citrus Catering & Events: The Foodie Blog: Midweek eats: Lemon basil cupcakes! ﻿These Lemon Basil cupcakes were a huge hit last week, so I thought I’d share the recipe with all you adventurous cooks out there. Lemon Basil Cupcake with Lemon Cream Cheese Icing and a Candied basil garnish. Using an electric mixer cream butter and lemon basil sugar. Fill paper-lined muffin cups 2/3rd’s full. Bake at 350 degrees for 20-25 minutes or until a toothpick inserted near the center comes out clean. Cool completely then frost and garnish. Prepare a cookie sheets lined with either wax or parchment paper. Place sugar in a shallow bowl or plate. Drop basil leafs in a bowl with the egg whites. Mix well to completely coat. Careful not to tear any of the leafs. Carefully dump the leafs into a strainer to strain out egg whites. Remove excess egg whites from each leaf then dip each leaf into the sugar evenly coating both sides. Place on cookie sheet to dry. Once completely dried the basil will be hard and ready to garnish. In an electric mixer beat the cream cheese and butter on high until smooth. Beat in vanilla and lemon extract, lemon juice, lemon zest and milk on low speed until completely mixed. To frost, cut about an ½ inch off the tip of a pastry bag (or a Ziploc bag) and fill with icing. Twist the top of the bag to push the icing down. Frost cupcake in a circular motion. Enjoy the rest or your week! We’ll see you back here on Friday for “What’s for dinner??" These cupcakes are yummy! I must admit I llllllovvvee cupcakes and this is the best thus far. It’s rare that you have a moist cake and flavorful but not too sweet icing combination. You either like one or the other but rarely both. Before trying this cupcake I was a little skeptical about the title but had to join in the tasting after the 5th person around started ranting and raving. Yum! I am excited that you have posted ordering information. Do you have a suggestion for a strawberry filling for these?